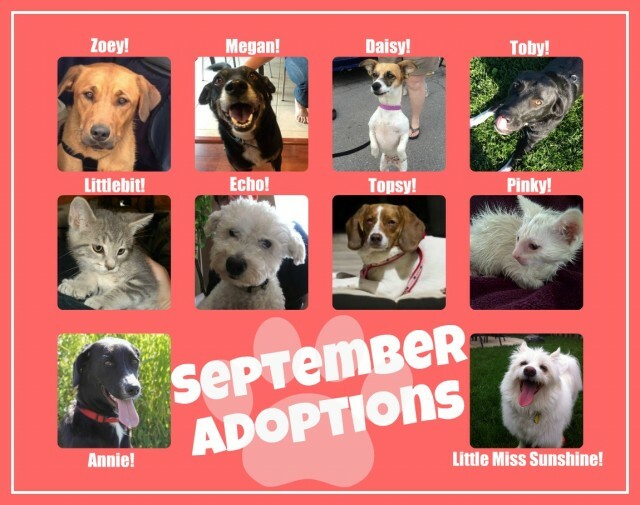 September was an AMAZING month for adoptions! 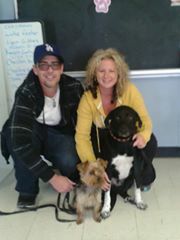 10 pets found homes this month and we are thrilled for all of them. ZOEY! This 1.5 year old Retriever/Labrador mix was rescued when TAGS pulled her from a high-kill shelter in Quebec. She is an affectionate sweetie who loves to play. MEGAN! Megan is a playful 3-year-old Hound mix who gets along very well with other dogs. She’s great on a leash and enjoys the company of others. DAISY! Oh Daisy. What a quirky little girl. This Chihuahua/ Jack Russell Terrier mix was rescued from Tennessee and is now enjoying life as a Canadian! TOBY! It is very exciting to the volunteers at TAGS that Toby has found his forever home. Toby was in our program for several months, although it wasn’t due to lack of applications! This cute, sweet boy received lots of interest, but due to his intense fears and lack of confidence, it was difficult to find him a home that would be perfect for him. 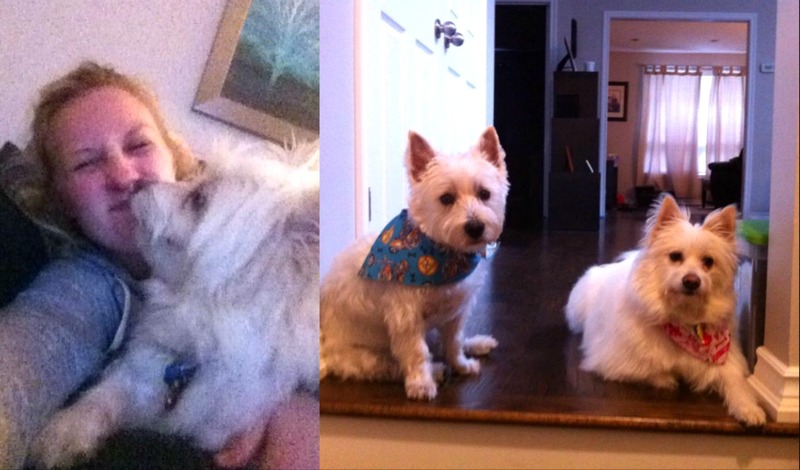 Thanks to the patience and guidance of his foster mom and his canine foster brother Sully, Toby has gained considerable confidence and has been happily adopted by a family ready to take care of Toby and be there for him when he gets scared. LITTLEBIT! Littlebit is part of a family of cats TAGS is currently trying to re-home. He is a very gentle kitten who loves to play and while he is more cautious than his siblings, he is still a very curious boy and his new family is certain to have fun watching him grow up. ECHO! Echo was not in our program for long, so you may not even remember seeing him on the website! This adorable 2-year-old Maltese/ Miniature Poodle is smart, friendly, and enjoys a good cuddle session. No one was surprised when he was adopted quickly! TOPSY! Topsy is a very sweet 3 year old Beagle mix who was living in a pound for a long time until TAGS rescued her. She is about 3 years old and enjoys playing with other dogs. She also REALLY enjoys laying around and is very content to hang out with her person doing whatever it is they want to do! PINKY! Pinky is one of Littlebit’s siblings. Her other two siblings, Frenchie and Wilson, are still looking for a new home, as is her mom Talia and her uncle Petcatso. Pinky was the first of the kittens to be adopted after she captured the heart of a little girl during a PetSmart showing. ANNIE! Annie is a beautiful 1 year old Border Collie mix who was rescued from a local pound a few months ago. She didn’t have a name, a home, or anything to tell us about her past, but we soon realized that she had a lot of energy and loves attention! Annie is now happily adopted and has turned into a fantastic running partner for her new Mom. LITTLE MISS SUNSHINE! Oh Sunny Sunny Sunny. This girl has been through so much in her life! Sunny is about 3 years old and found herself without a home over a year ago. It has been a long road to get her to where she is now. First, she was left in a shelter when her owner could no longer care for her. Then she was pulled from there by a dog rescue, before being added to the TAGS family not long after that. Hesitant to trust and lacking a bit of training, Sunny had to switch foster homes three times before she was able to even think about settling in. After a few months in that foster home, months where her foster parents spent a lot of time working on her manners and basic training, Sunny was adopted in May. However, after a few weeks her new family realized she didn’t quite fit in with them after all, and she was up for adoption once more and returned to her foster home. So many ups and downs for a girl who has a hard time with change! After a summer of adventures with her foster family and of course, more training, it was finally settled: Sunny had been home all along. It is very clear that Sunny is the happiest and most comfortable version of herself when she is with her foster parents (now forever parents) and her brother Oliver. And of course, they can’t imagine life without her, either. Again, congratulations to all of the dogs and kitties who found homes in September! We are so happy for them and their new families. Although September was amazing (10 adoptions, woo-hoo!) we are always adding more animals to our program. Find out about them on our adoptable pets page.